Print the clip, (works best in PET/ABS) due to it being slightly less brittle. But PLA is fine too. 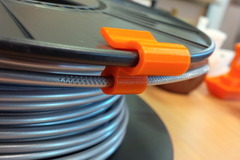 Filament goes through the tuby thing, and clips onto your reel. Clip on the side that it doesn't face your printer or the unspooling during printing may push it off.